I made this almost a year ago, as a thank you for a special couple who were our hosts at Christmastime. This card is chock-FULL of personal, custom details. 1.) 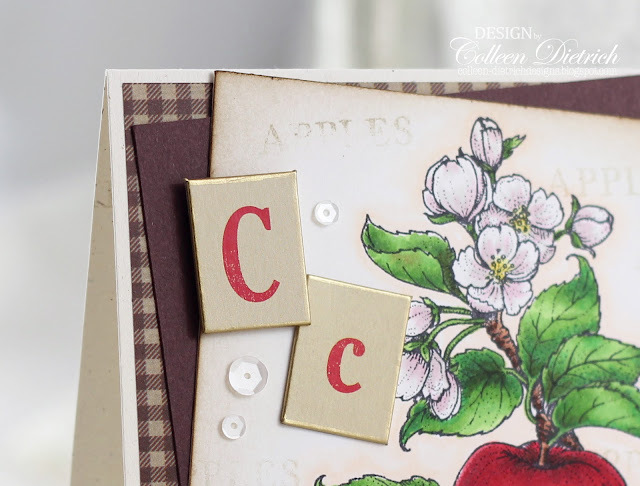 Our hosts' last name begins with the letter C. I used chipboard tiles from Girls' Paperie, and I ran an 18kt Gold Pen from Krylon around the edges of these tiles. 2.) Our hosts live on a street that is named for an apple. 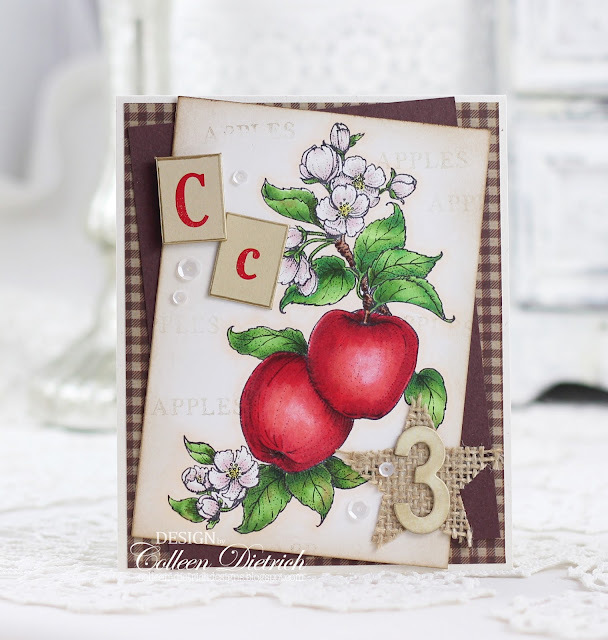 I used the stamp set, Apple of My Eye by Flourishes for the focal point, and colored with Copic markers. Just barely visible, I stamped the word 'apples' in the background very faintly. 3.) Our hosts' house # is 3. 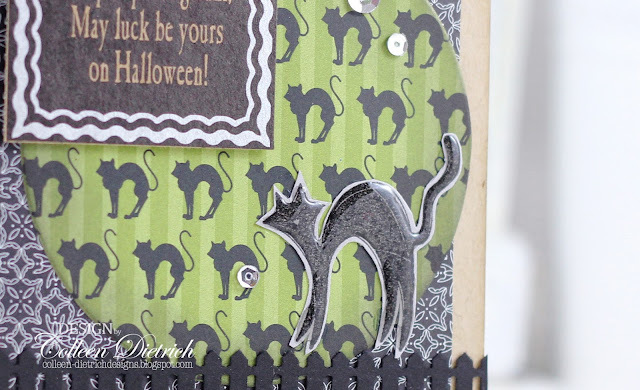 Again, another chipboard piece from Girls' Paperie came to the rescue. Hello! 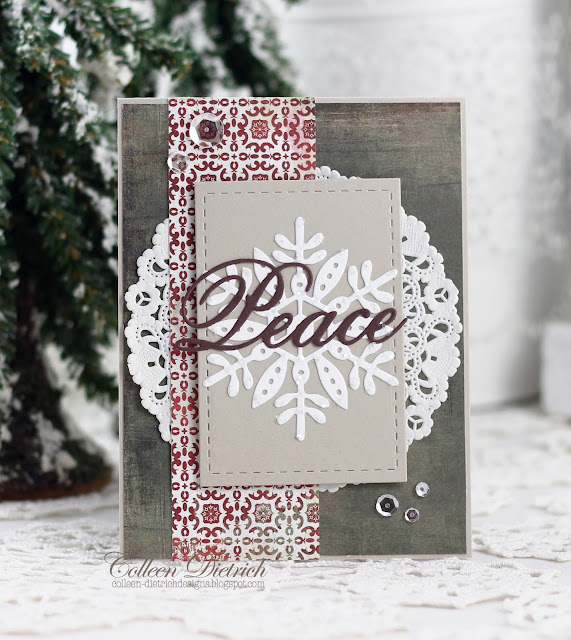 Today I'm sharing a Christmas card that features a muted version of the traditional red and green. 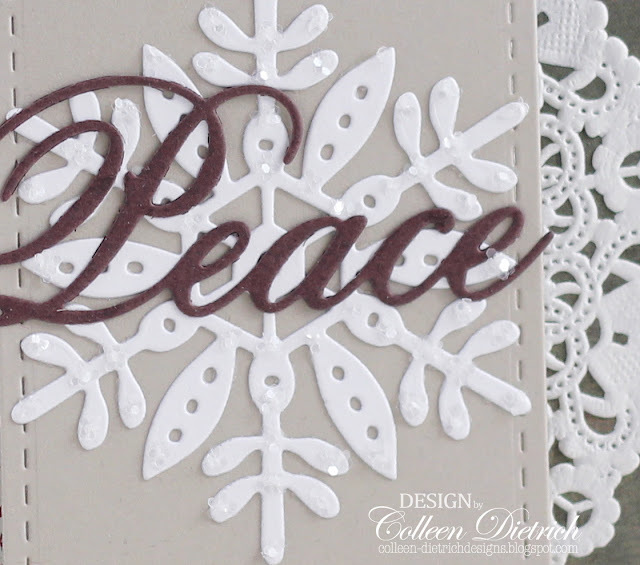 The highlight of the card is the "Peace"-topped snowflake, set on a stitched rectangle die cut. 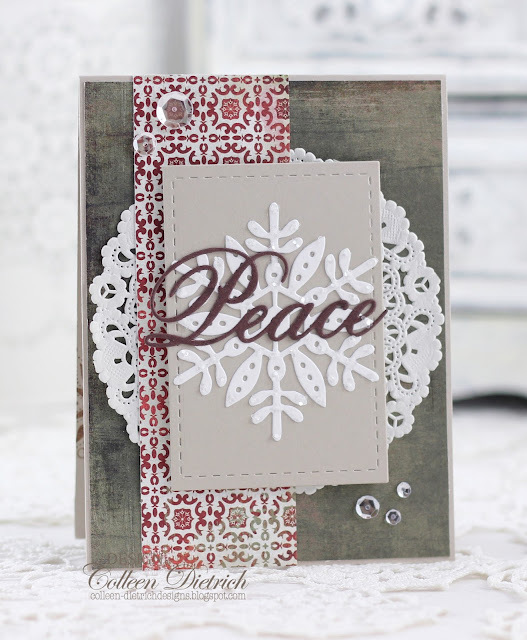 You might be able to see that clear crystal glitter was added to the snowflake (Avery Elle Noel). 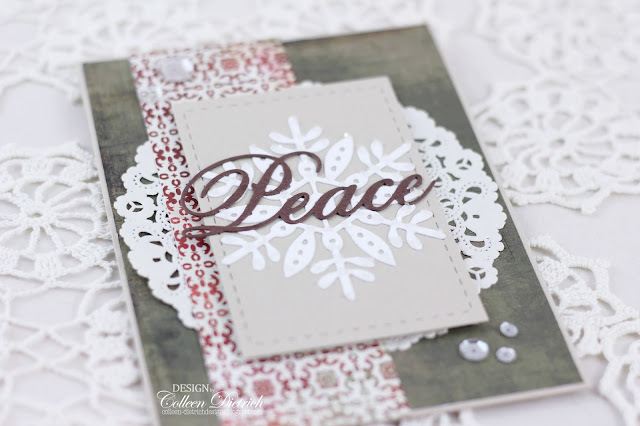 The Peace die is from Impression Obsession, and I do so love that fancy font. Thanks so much for visiting me today, and Peace be unto you! My sister-in-law and brother-in-law celebrated their one year anniversary earlier this year. Their wedding was held at the Jersey Shore, and it was such a lovely day! 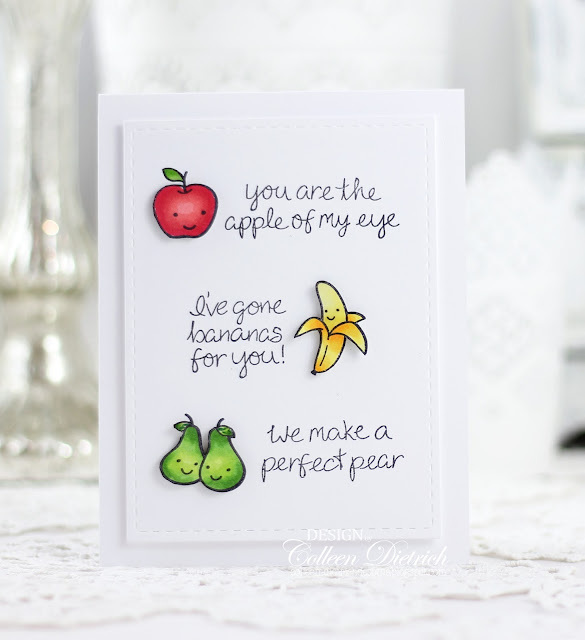 You may remember this card I made for that special day. The guests who stayed overnight at their wedding were given striped treat bags containing fun snacks and drinks. Each bag featured a customized label with their wedding date and names. I saved one of the bags, carefully cut it apart, and made sure to include that label. I blurred out the date for this post, but you can see I decorated the spot above their names with a Spellbinders die cut and a few matching gems. The anchor was on another favor from that day, and I used a circle punch to cut it out and create an embellishment for the lower part of the card. The bow was made with vintage Irish linen twine. 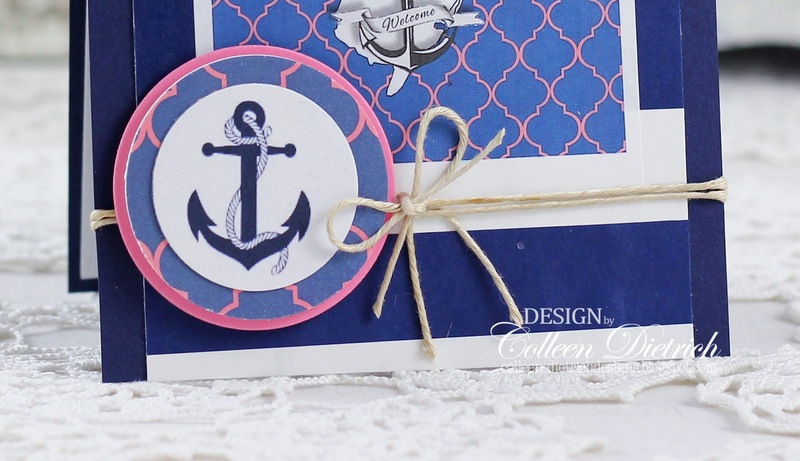 And I loved the anchor image so much that I was inspired to buy an anchor stamp shortly after the wedding! 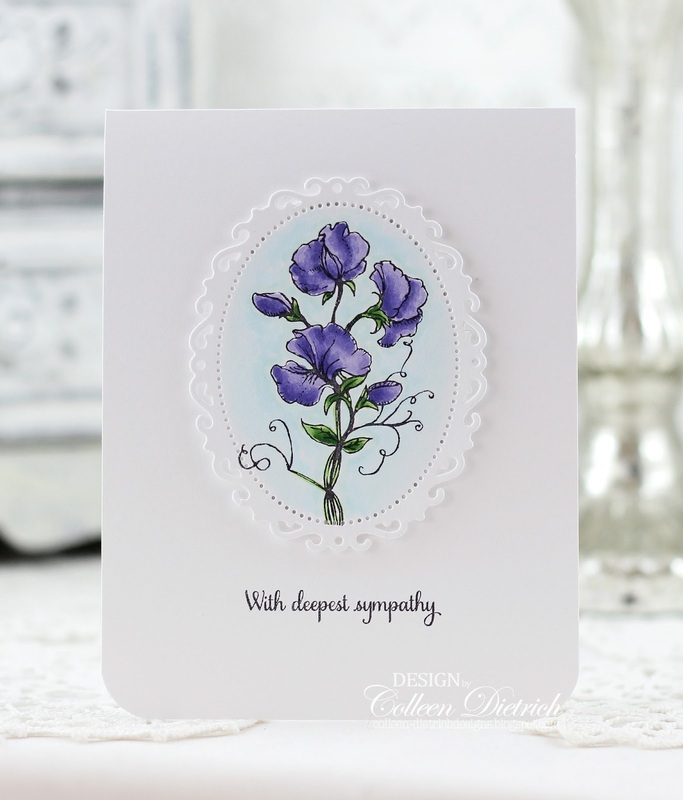 As I sit here typing up some posts in a batch today, I realize I've made a lot of sympathy cards this year. Some are for the shop, and some are for people I know who are bereaved. This card was made for a friend who lost his wife to a brain tumor. Broke my heart to see him go through the valley as his beloved suffered. Upon her passing, I knew exactly which stamp I wanted to use for a sympathy card, as her nickname was 'Sweet Pea'. 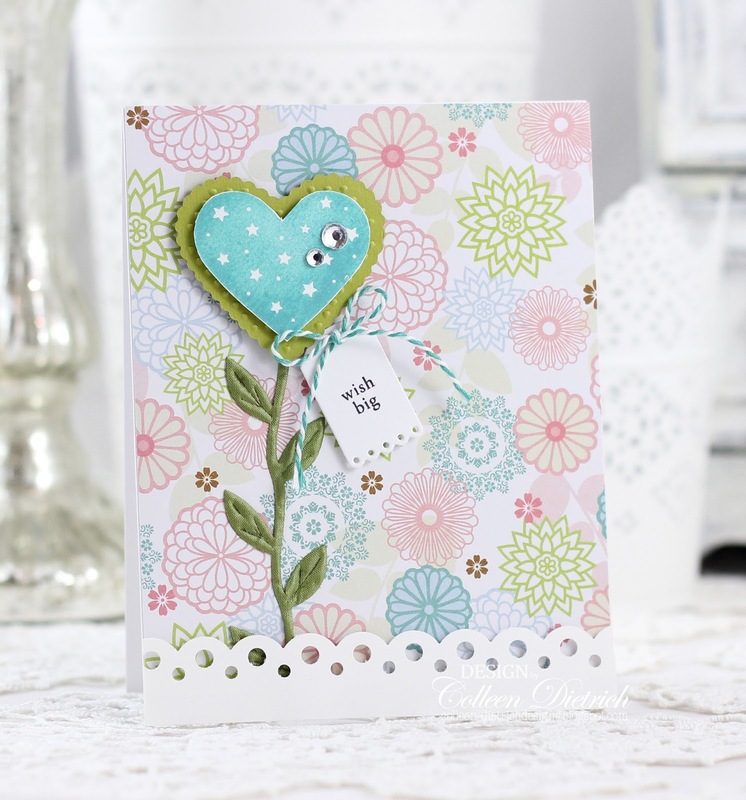 I pulled out Sweet Pea from Flourishes, and stamped the smaller image onto a Spellbinders Floral Ovals die cut, then used Copic markers to color and shade. 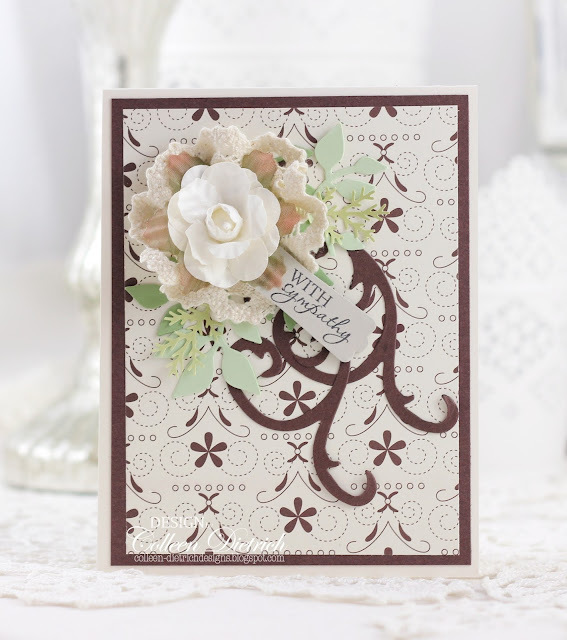 The sentiment is from Papertrey Ink's Words of Comfort set. I use that set a lot. Thank you so much for your visit today. 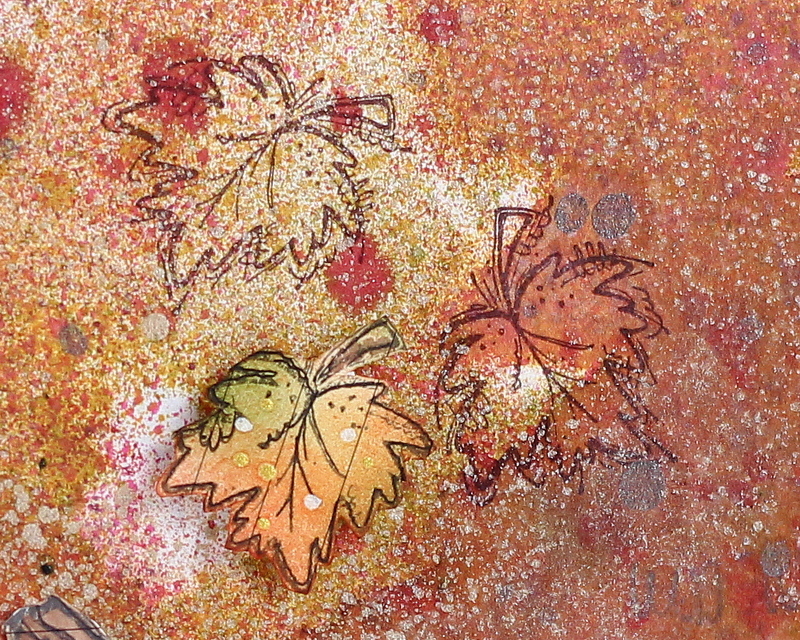 I was playing around with Distress Ink Sprays one day, and came up with this beautifully-mottled background. 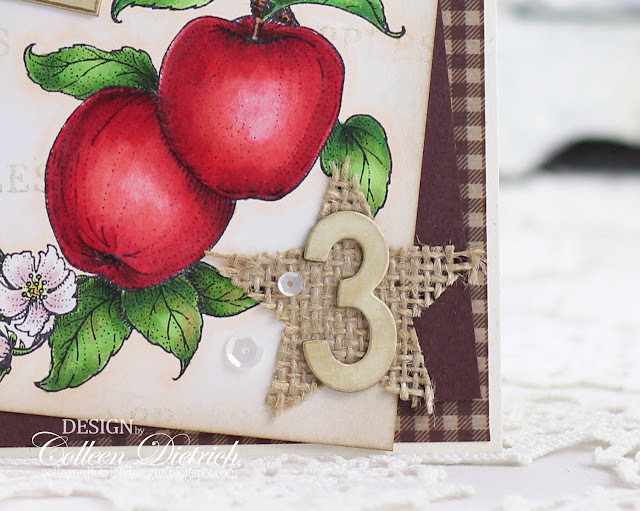 In order to keep it part of the focal point, I added sparing details: stamped pumpkins, a sentiment, and a few stamped leaves. Then, I surrounded it with an embossed frame. 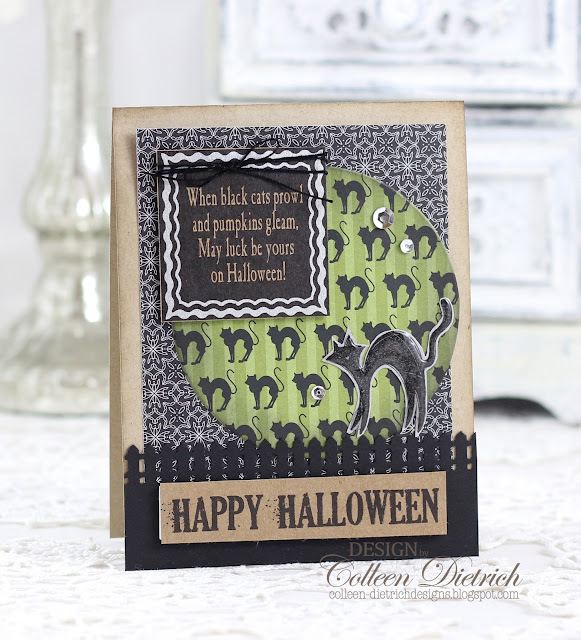 The pumpkins (Stampin' Up! 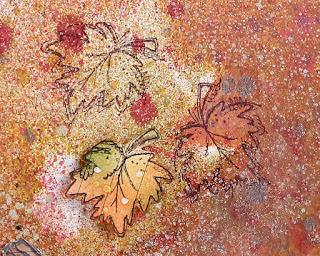 Autumn Harvest) were stamped on lined paper, inked with Distress Inks, then trimmed out and placed on the background. 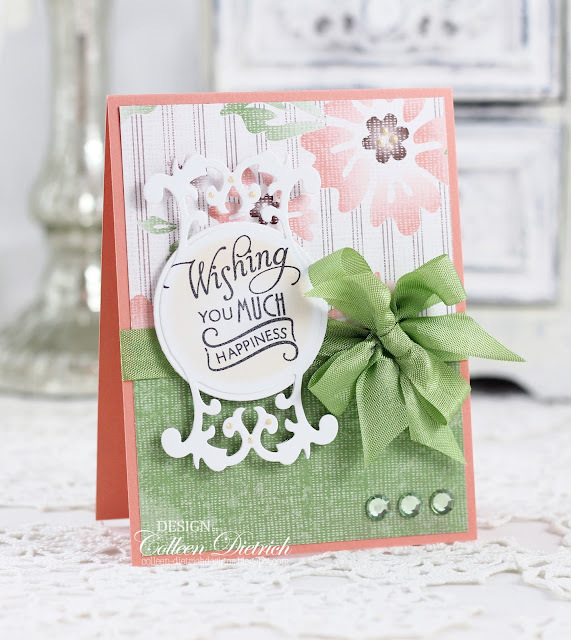 Sentiment is from Inspired By Stamping's Little Phrases. 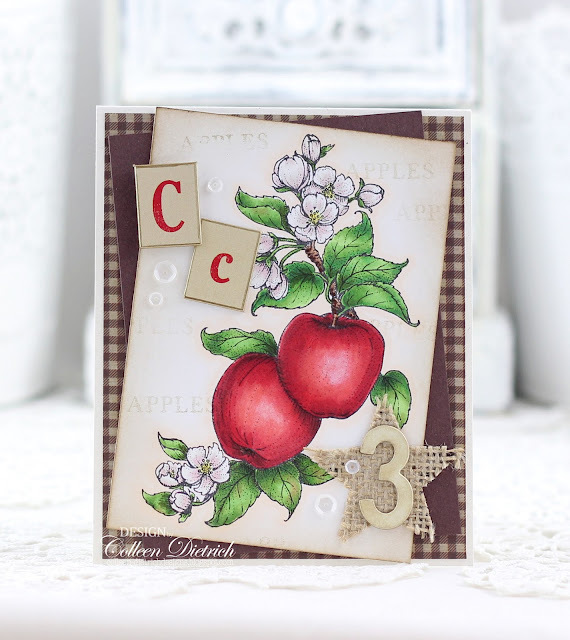 As you can see in the picture below, I stamped the leaves (also from Autumn Harvest) directly onto the background, and then once on lined paper, trimmed out and popped up on foam tape. This was such a joy to make! I love autumn, my favorite time of year. And as I get older, I appreciate the profound meaning of our Thanksgiving holiday...but my heart has thanks-giving in it every day of the year. My life is full of blessings from above. Well, I'm quite late in sharing this anniversary card I made for my husband. 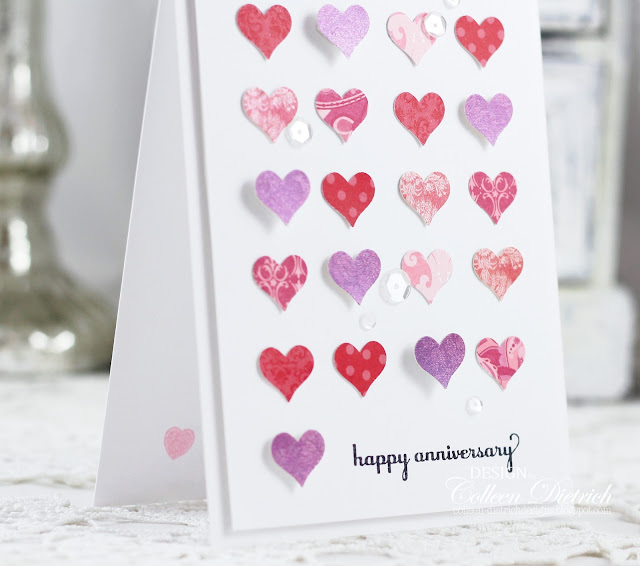 We just celebrated 22 years of marriage, but this card is from our 21st anniversary. Just a bit late, huh? I used an Itty Bitty Accents (Stampin' Up!) 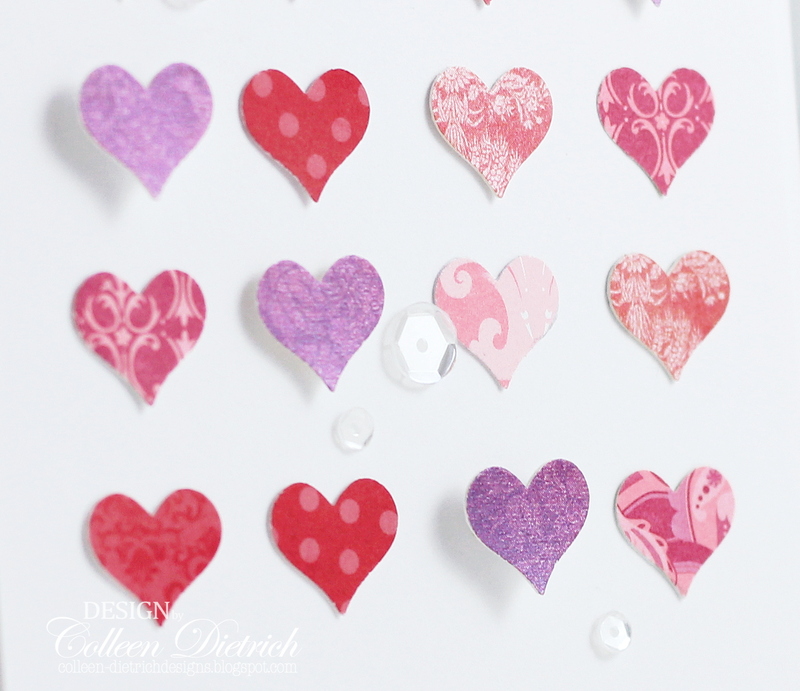 heart punch 21 times, using various patterned papers. I measured carefully so things would line up, and adhered the hearts in a grid pattern, popping up some of the hearts on foam tape. 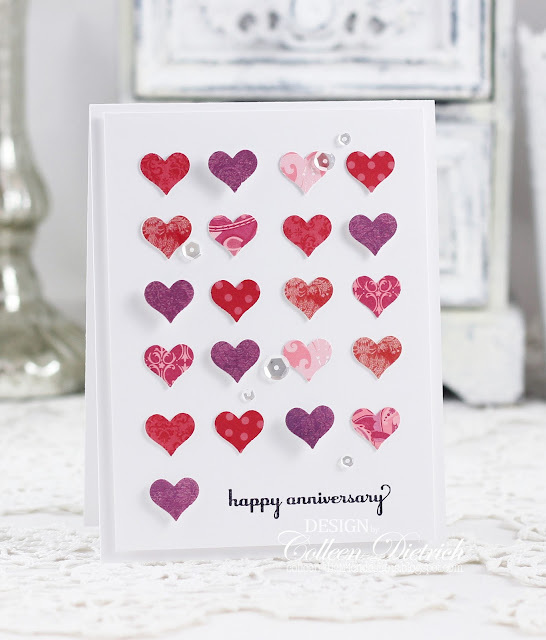 Several Sparkling Clear sequins (Pretty Pink Posh) were added, and the sentiment is from Power Poppy's Dynamic Duos: Peonies and Tulips. From the day we pledged our love, I seem to love you more. 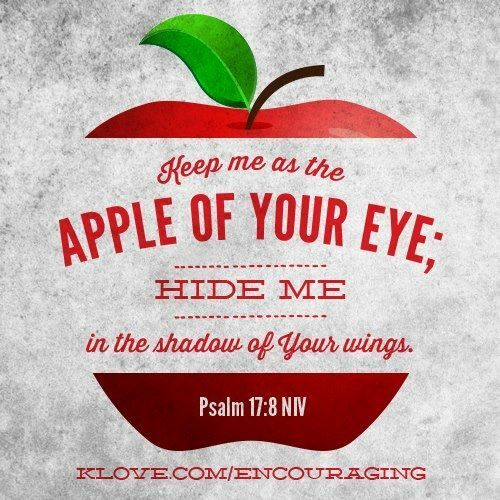 Over time our love has deepened and grown stronger in the Lord. Through all the ups and downs we've had, our love has not grown dim. The light burns brighter to reflect the love of God within. Wouldn't this card brighten someone's day? 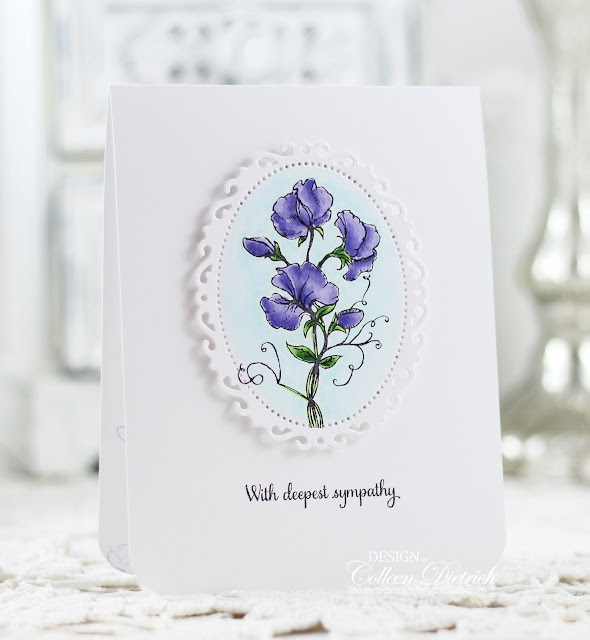 With a sentiment like this, (Verve Brighter Days) this card could be for a birthday, or a new home, a wedding....or just to offer cheer to somebody who is walking through a valley. Thanks so much for coming by today, and I wish you a wonderful day! 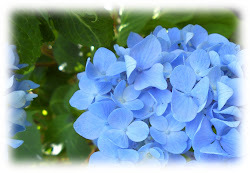 Our neighbors lost a father and grandfather earlier this summer. 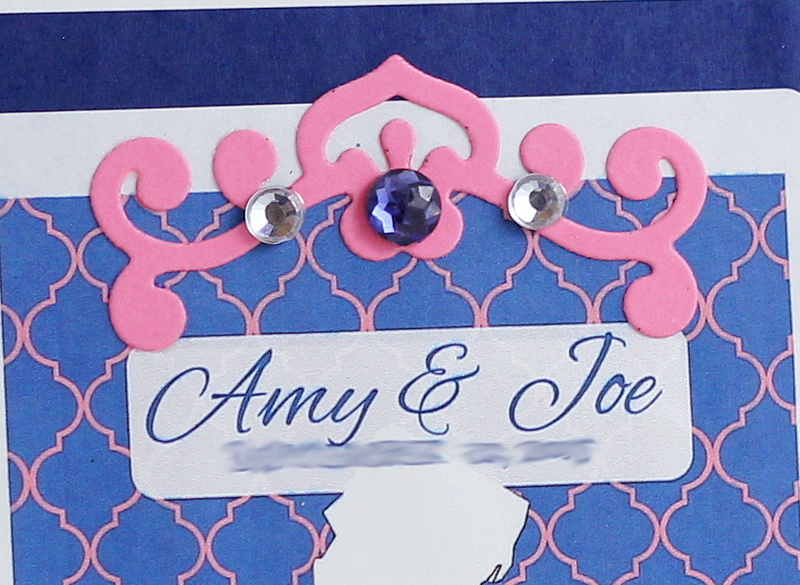 I whipped up a sympathy card for them with some supplies that were already die-cut / punched, for a quick make. 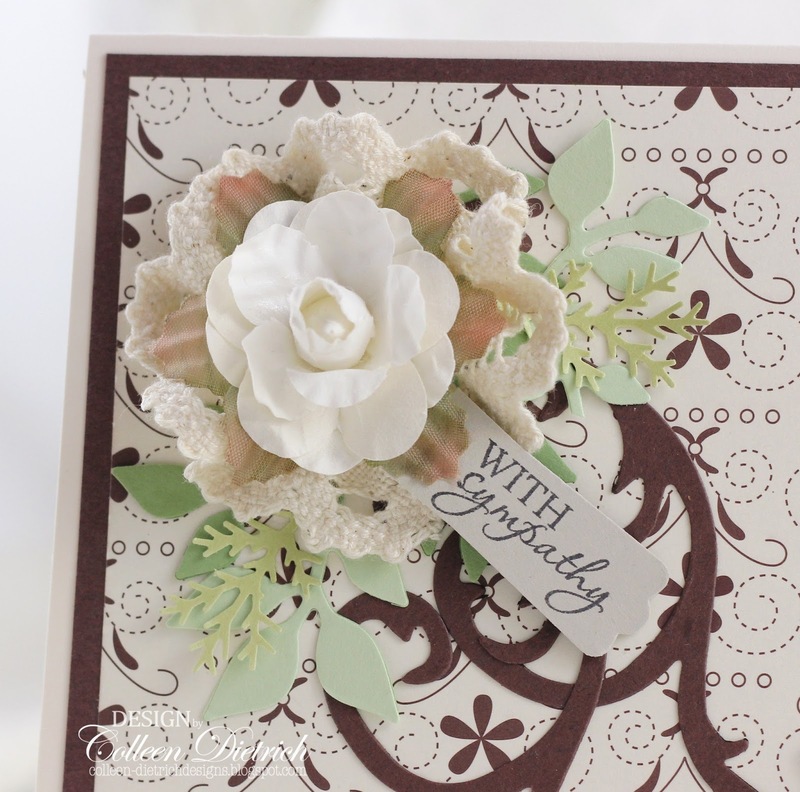 The sentiment is from Papertrey Ink Daily Design Sentiments, and the tag is nestled in between a bridal-favor flower from the craft store, and some crocheted lace ribbon that I stitched into a flower. 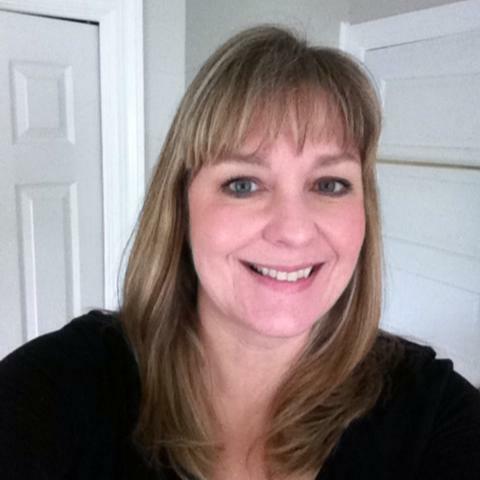 I so appreciate your visit today. Clean and simple, that's the vibe of today's card. 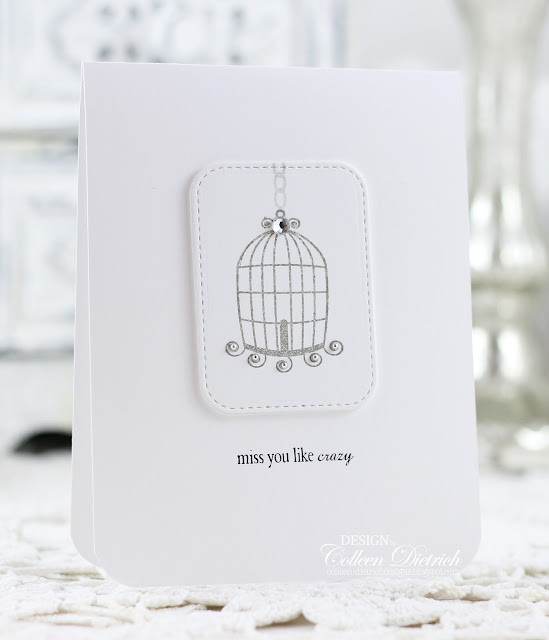 An empty bird cage and a 'miss you like crazy' sentiment, with lots of white space all around, it's about as simple as can be. 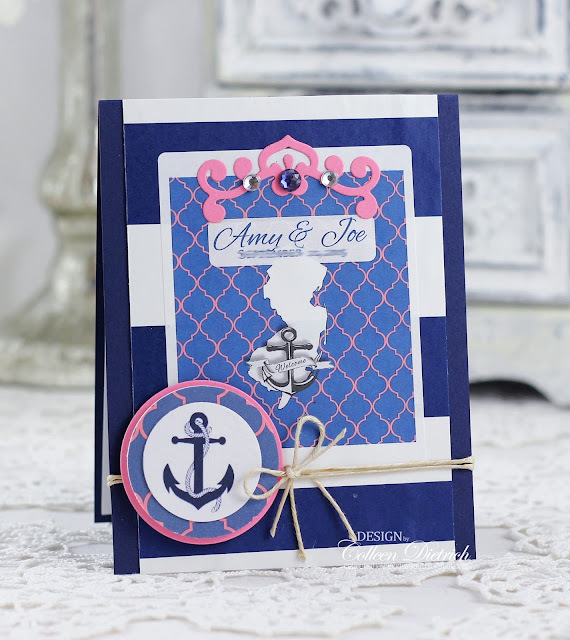 Do you have a favorite brand of cardstock? I always use Papertrey Ink's white cardstock. Love the heft and the pure whiteness of it. 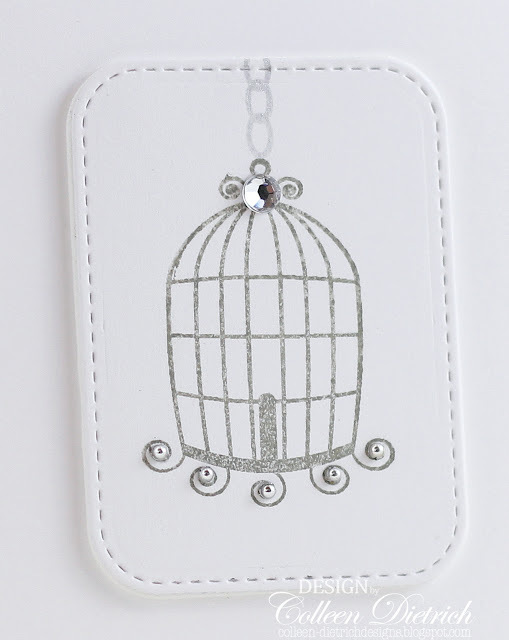 On a Stitched Rounded Rectangle die cut (My Favorite Things Dienamics), I stamped a bird cage (Sweet Aviary / Inspired By Stamping) in pale gray ink, added a chain from another stamp set, and added rhinestone and small silver balls as adornments. The sentiment is from Verve's Heartfelt Phrases. The sentiments are actually chipboard pieces that I bought at Tuesday Morning (sheets and sheets of them! I'm ready for many Halloweens to come). I am overjoyed to have cooler weather that goes nicely with the beautiful autumnal colors on the trees. We had a warmer spell again recently, and let's just say I'm not a fan of that unseasonable warmth. I know I'm not alone in that sentiment. All the stamps are from Lawn Fawn's My Silly Valentine. 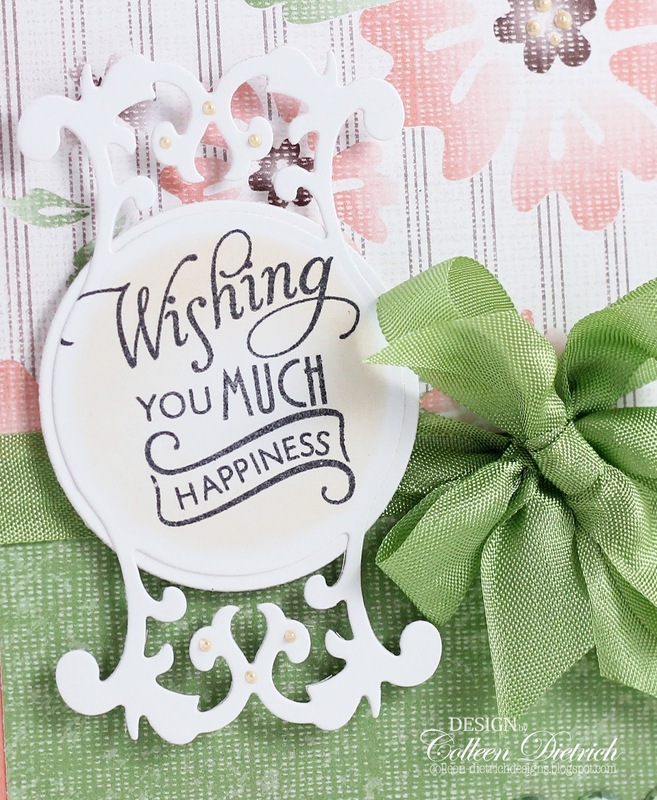 Thanks for coming by today, and may your day be filled with blessings! Well, my garden outside isn't doing a whole lot of growing right now, but we do still have some blooms lingering on the annual flower plants we've left in place for now. 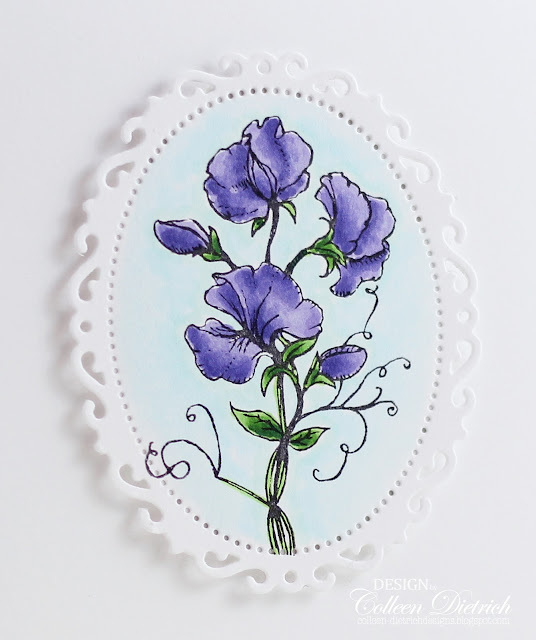 Luckily, in the world of papercrafting, flowers are ALWAYS in bloom! Hooray! 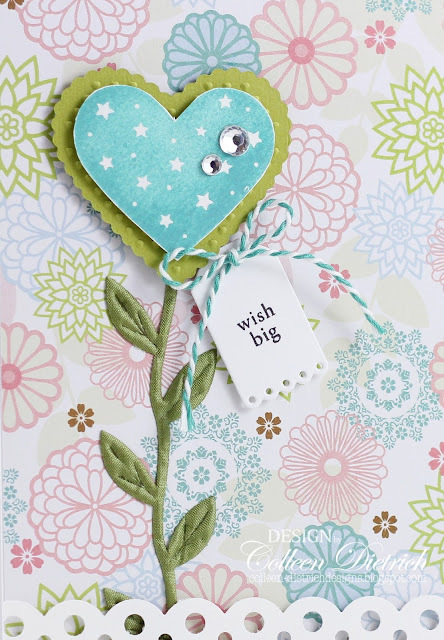 I had stamped this heart a year ago, and it was waiting to be used (Hero Arts Year Round Sentiments), so I turned it into a flower. There's a die-cut heart (Heart of Heart Embosslits - Stampin' Up) behind the starry heart, some leafy ribbon as a stem, and a little Tiny Tag (Papertrey Ink Tiny Tags stamp set and die) tucked in. 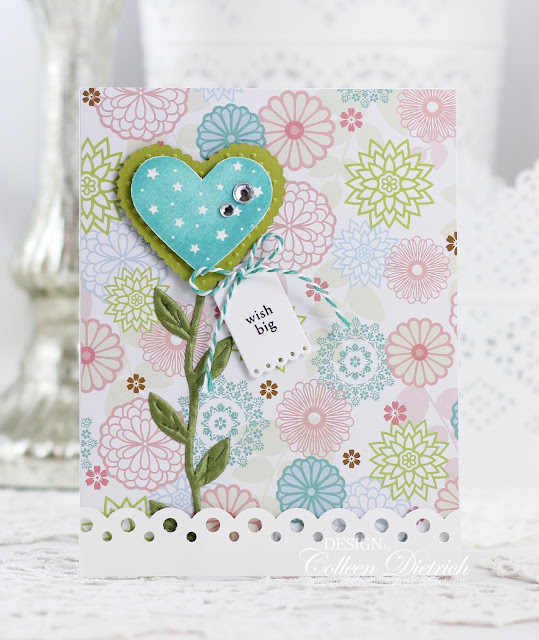 The Martha Stewart Scallop Dot border punch helped create a 'window box' to plant this flower in.